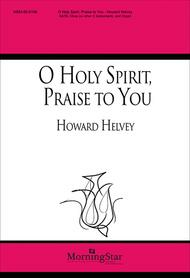 O Holy Spirit, Praise to You composed by Howard Helvey. For SATB choir, organ, oboe. Pentecost. Moderately Difficult. Octavo. Published by MorningStar Music Publishers (MN.50-5106).An original setting based on a text by Mary Louise Bringle. Bringle's hymn is influenced by the writings of Hildegard of Bingen (b. 1098), particularly her chant O Ignee Spiritus, laus tibi sit (O Fiery Spirit, Praise Be to You). A plaintive oboe leitmotiv, developed throughout the anthem, and Helvey's tender new hymn tune COELIUS, serve to establish and maintain the music's overall tranquility. Reproducible Oboe part included.